Title: 09/29/1994 - Occupational Safety and Health Administration's (OSHA) regulations for ozone. This is in further response to your letter of July 26, concerning the Occupational Safety and Health Administration's (OSHA) regulations for ozone. Please accept our apology for the delay in this response. OSHA regulates employee exposure to ozone gas through its Air Contaminants Standard, 29 CFR 1910.1000 (copy enclosed). The permissible exposure limit (PEL) is listed in Table Z-1 as an 8-hour, time-weighted average value of 0.1 part of ozone per million parts of air (ppm). Rule 29 CFR 1910.1000(e) requires that administrative or engineering controls must first be identified and implemented whenever feasible to achieve compliance with the PEL. When such controls are not feasible to achieve compliance, personal protective equipment, respirators, or any other protective measures shall be used to keep the exposure of employees to ozone gas within the PEL. Another applicable OSHA standard is the Hazard Communication Standard (HCS), 29 CFR 1910.1200 (copy enclosed). The HCS provides workers exposed to hazardous chemicals with the "right to know" the identities and hazards of those materials, as well as appropriate protective measures. When workers have such information, they are able to take steps to protect themselves from experiencing adverse effects from chemical exposure. 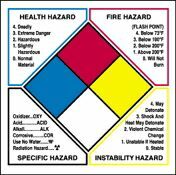 The HCS requires employers to develop and implement a written hazard communication program for their workplace if their employees are exposed to hazardous chemicals. Employers are also required to ensure containers are labeled with an appropriate hazard warning; maintain material safety data sheets (MSDSs) in the workplace and make them readily accessible to exposed workers; and train employees to understand the hazards, know how to protect themselves, and be able to use the available labels and MSDSs. The labels and MSDSs are developed by the chemical manufacturer or importer of the product and provided to downstream employers when they obtain the hazardous chemical for use in the workplace. We appreciate the opportunity to assist you. Should you require further assistance please feel free to contact OSHA's Office of Health Compliance Assistance at (202) 219-8036.